In Chicago, riding in a taxi cab is a way of life. One of the beauties of taxi cab use is that you do not have to worry about parking and about drinking and driving. Many Chicagoans forego owning a car to avoid the expense of the car, gasoline, insurance and other costs of car ownership. Taxi cab usage can make living in the city of Chicago more carefree. Unfortunately, one of the dangers of taxi cab usage is bad driving associated with many cab drivers. Chicago cabbies have earned a reputation for careless driving. This careless driving leads to accidents involving injury to other drivers of vehicles on Chicago roadways, injury to pedestrians crossing Chicago streets, injury to bicyclist riding along Chicago streets and injury to passengers in the taxi cabs themselves. In the city of Chicago, taxi drivers must drive cabs which have medallions on them. Medallions are basically licenses to operate a taxi cab in the city of Chicago. Medallions are issued by the City of Chicago Department of Consumer Services. There are a limited number of taxi medallions issues, so in order to buy one, you typically have to buy one from someone who already owns one. This creates a market for the sale and purchase of taxi medallions. Over the last 10 years, the prices a taxi medallions has fluctuated between $200,000 to $400,000 per medallion. It is truly a supply and demand market. All taxi cabs in the city of Chicago are regulated by the City if Chicago Department of Consumer Services. If you wish to operate a taxi cab in Chicago, you must be licensed by that agency to drive a cab. Frequently, drivers of taxi cabs are not driven by the medallion owners, but instead are leased by the medallion owner to drivers for period of time as short as one day, one week, one month or more. Sometimes, these cabs are leased for 8 hour shifts during a 24 hour period of time to three different drivers. Usually, a taxi cab is affiliated with a taxi dispatch company. Among the largest are Yellow Taxi, American-United Taxi, Flash Cab, 303 Taxi, Carriage Taxi and Dispatch Taxi Affiliation. In the city of Chicago, taxi cabs must be insured in the amount of $350,000 per occurrence. While this provides assurance of insurance coverage for many injuries suffered with accidents involving taxis, it is not enough insurance when someone suffers catastrophic injury or death. In legal cases against taxi companies and their drivers, the issue of agency is often heavily litigated. The taxi companies will attempt to claim that the driver is not their employee or agent, thus they are not legal responsible for injuries or death caused by the driver. The Chicago personal injury lawyers at Nemeroff Law Offices have developed expertise at fighting this issue in an attempt to hold the dispatch company with greater assets at fault. When a person is a passenger in a taxi cab and is injured due to the negligence of their own driver, the issue of apparent agency is frequently pursued. Basically, the passenger will try to claim that they selected the taxi because of its reputation for safety or called a specific taxi company to come pick them up. When a company hold themselves out of being the owner/operator of the cab, even if that is not truly the case, the taxi cab company can be found legally liable for the actions of the driver of the cab. Currently, only taxi cabs with medallions can pick up passengers from O'Hare Airport and Midway Airport. These cabs start out in the city and frequently take passengers outside the city limits to suburban locations. Many times, major highways such a I-55, I-294 toll road, I-90, I-290 and I-94 are used. It is not unusual for accidents involving Chicago medallion cabs to occur on these highways or in the suburbs of Chicago. 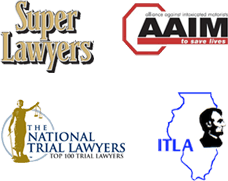 Hiring an experienced Chicago personal injury lawyer like the ones at Nemeroff Law Offices is the key to a successful conclusion of a personal injury or wrongful death claim involving a taxi cab. Call us now at (312) 629-8800 for a free consultation.